Learn from these yoga teachers who are rocking it on Facebook! There are a lot of great Facebook yoga pages out there. If you’re trying to create your own Facebook yoga page, there’s no shame in stealing from taking inspiration from your fellow yoga teachers. In fact, looking at examples is one of my favourite ways to learn! That’s why we do demos in yoga class, right? This is a diverse group of yoga teachers. They all have one thing in common: they are working hard to create great Facebook yoga pages, vibrant communities online, and to get more students to their yoga events! I’m not claiming these are the best Facebook yoga pages or the most popular Facebook yoga pages or that these are the best yoga teachers on Facebook. They’re just Facebook yoga pages that can teach us how to use Facebook to market ourselves better. 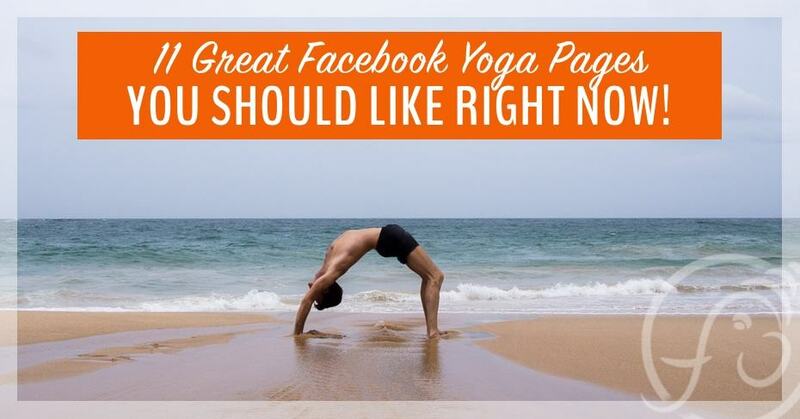 If you want to get better at Facebook yoga marketing, Like and Follow these pages so you can continune to get inspiration for your own great Facebook yoga page. What’s Great on Nichol’s Facebook Yoga Page? I love Nichol’s profile picture and her cover photo. EShe took the extra time to add a short, thoughtful phrase to her photo. It says: “Lives. Less ordinary.” Though I’m not 100% sure what that means, it makes me want to find out more. Nichol is also doing a fantastic job promoting her classes while mixing in personal messages and regularly adding short, helpful videos. 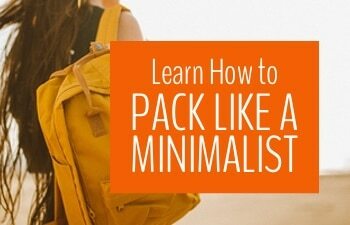 This is the post that made me choose Nichol’s Facebook yoga page for this list. Sharing what inspires you is a great way to give students a window into your soul while helping them find new inspiration themselves. 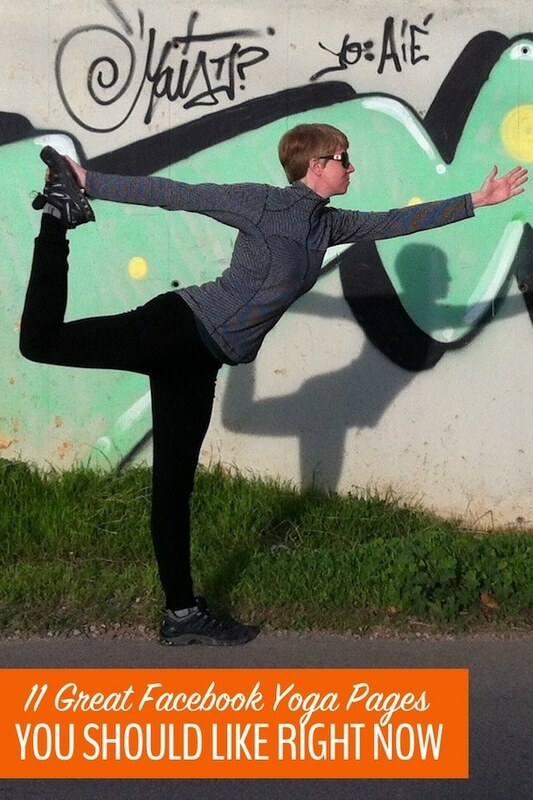 What’s Great on Pille’s Facebook Yoga Page? Pille’s cover photo says so much about her style. Though I’ve never practiced with her, I assume she teaches a challenging physical practice and encourages students to try try try. I also like how Pille uses a variety of post types and topics. It’s not all yoga all the time but it’s all yoga-related – food, nature, mindfulness, gratitude. It gives a sense of Pille as a multi-faceted person. Finally, her About page is great and I love how she’s used the “Story” section to list her classes for the week. Very smart. In this post, Pille gives us a little inspiration, a smile for the day, and she also shares a whole lot about who she is, both through the photo and the quote. 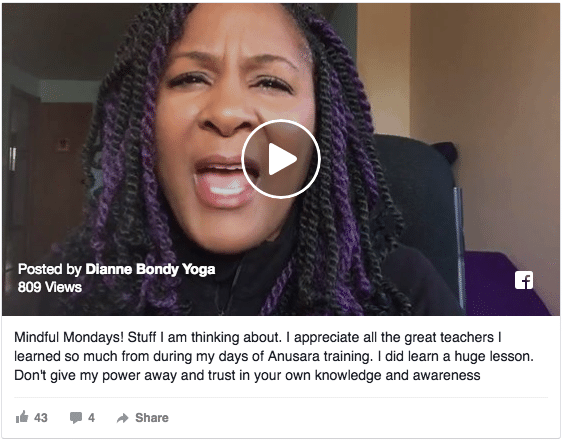 I love that Pille shares videos and quotes from other pages, like the BBC video of kids practicing mindfulness. These shares would be even better if she made a quick comment on the post before sharing. Just something simple like “This made me laugh. I hope it brightens your day, too.” That small change would give her shared posts a more personal feel, like she’s my friend, sharing just with me. What’s Great on Michael’s Facebook Yoga Page? Aside from the stunning photography (seriously, who is taking this guy’s pictures and can they teach me how to be awesome too?!? ), Michael always accompanies the photos with thoughtful and insightful text. His posts are short and sweet but they share so much. I also really like that he has used his page name to give a little more info about himself. So instead of just “Michael James Wong Yoga” it’s “Michael James Wong – Global Yoga & Wellness Warrior”. Cool. I’m stealing that idea! See what I mean about simple and sweet? In this picture, Michael is just sitting on a rooftop in a casual half-lotus. By adding a short comment, he makes this photo all about his students and what is in their hearts. I’d love to see some more open-ended posts on Michael’s page to encourage comments and conversation. Instead of just sharing statements, he could ask questions and ask people to share their experiences and thoughts. This would boost engagement on the page and start to create a sense of community. What’s Great on Ammi’s Facebook Yoga Page? 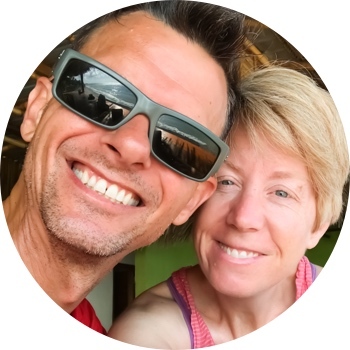 I decided to include Ammi’s great Facebook yoga page here to show you that even if you don’t have a ton of Likes yet, you can still use Facebook as a space to communicate with your students and showcase yourself as a yoga teacher. Scrolling through Ammi’s posts, I noticed great variety… some class promos, some helpful videos, some snapshots of her personal life. Also, her use of photos, memes, and quote photos to promote her classes is really great. These eye-catching photos are going to get noticed in her student’s feeds. 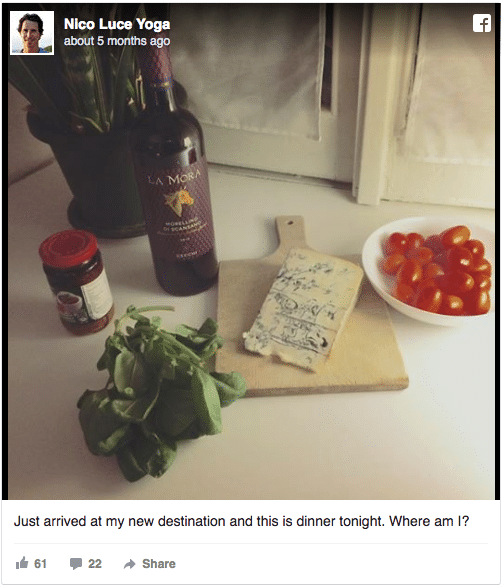 Facebook is a visual place, so be creative with your choice of images to get noticed! Everything is right about this post. 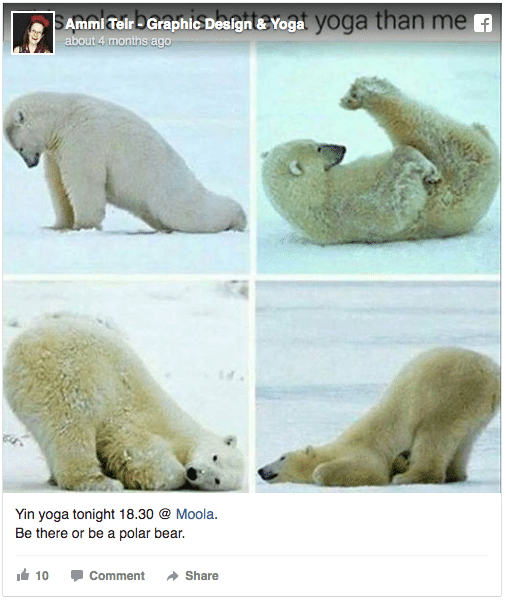 The polar bear photo is eye-catching, the comment is short and funny, and Ammi uses it to promote her upcoming class. Perfect. Ammi has such a joyful smile, I’d love to see it in a nice close-up for her profile picture. Her logo is nice but it doesn’t tell me much about Ammi as a person. Also, since her page is called Ammi Teir – Graphic Design & Yoga, then I would like to see more graphic design-related material on her page. Let’s see the other half of your life, Ammi! What’s Great on Noah’s Facebook Yoga Page? I know I’m always using Noah’s great Facebook yoga page as an example… but there’s a reason for that. Noah uses Facebook really well! Even though he has 150K likes, he’s not afraid to share his personality while also promoting his brand. That’s a delicate balance and he manages it really well. Also, his page is a great lesson in promotion. He’s not afraid to promote his offerings frequently — and you shouldn’t be afraid to do it either. Your posts are only seen by about 10% of your followers (depending on your page size) so go ahead and repeat yourself! The more famous you get, the harder it is to stay authentic and avoid worrying about what your followers will think. Noah seems able to avoid self-consciousness entirely. 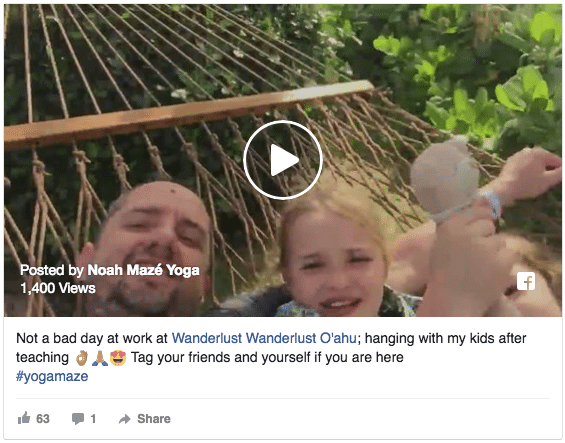 This post of Noah and his kids, live from Oahu Wanderlust, is such a great moment. Totally authentic, totally adorable and shows you exactly who Noah is. Plus, it tells you a lot about what you’ll get if you become his student. The lesson: Whether you have 51 fans or 151,000 fans, be yourself! If you check out the left-hand navigation bar on Noah’s Facebook page, you’ll notice links that you don’t usually see on Facebook, such as “Meet Noah”, “Online Classes”, and “Welcome”. While this is a clever way of getting people off of Facebook and onto Noah’s website. Generally, people get annoyed when they click a link that takes them somewhere unexpected (in this case, off of Facebook and onto Noah’s site). I would suggest keeping just the most important link — maybe “Online Classes” — and removing the other custom links. What’s Great on Dianne’s Facebook Yoga Page? 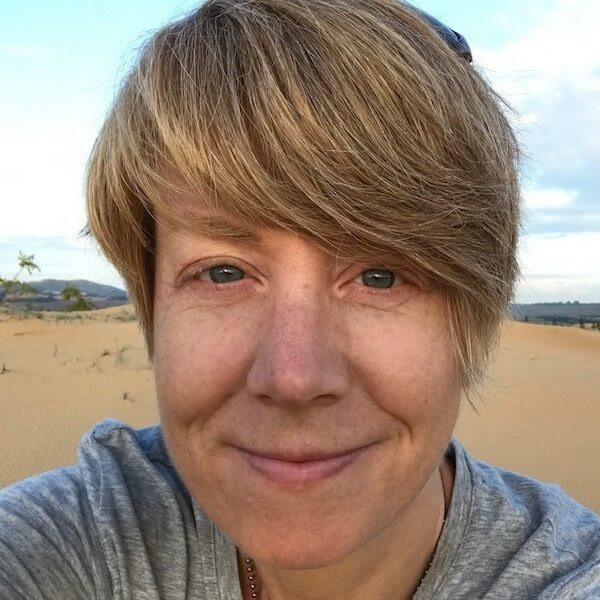 I love Dianne Bondy so much – and I’ve never met her. How could I possibly love someone I’ve never met? Because she is 100% authentic on Facebook. She’s not afraid to be funny, smart, vulnerable, emotional, and inspiring and she’s not afraid to share her highs and her lows. I can’t think of another yoga page on Facebook that feels so much like a conversation with a close friend. Dianne makes full use of video on her yoga page. This post will inspire those of you who are afraid to try video because it’s just too hard/scary/technically challenging. This video is the very essence of “switch on the camera and go”. You can tell that Dianne has thought deeply about the issues she’s discussing, but she didn’t sit down and write a script. And notice that even though it’s not a video of Dianne doing yoga asana, and not even about yoga per se, it still fits perfectly into her brand. Dianne has an amazing joyful smile, so I’d love to see a close-up of it on her profile photo. And, of course, I’d recomment using her cover photo to show her in action, either practicing or teaching. These two photos are often the decision point for new students – should I stick around or should I click away? If you don’t use them to showcase yourself, you’re probably missing out. Damn, that is one beautiful cover photo! This is why I recommend that you spend some time getting some terrific yoga shots. Natalie’s cover photo makes me want to dive into her page (and into her world) and know more. If you check out the Cover Photos folder in Natalie’s Photos tab, you’ll see that she has always used outdoor yoga shots for her covers. That’s called consistent branding, folks! The other big takeaway from Natalie’s page is the tab that says “Instagram Feed”. If you have Instagram, and you use it for your yoga business, adding your feed on your Facebook yoga page is a great way to give people quick access to a whole other side of your practice. And it will also get you more followers on Instagram! 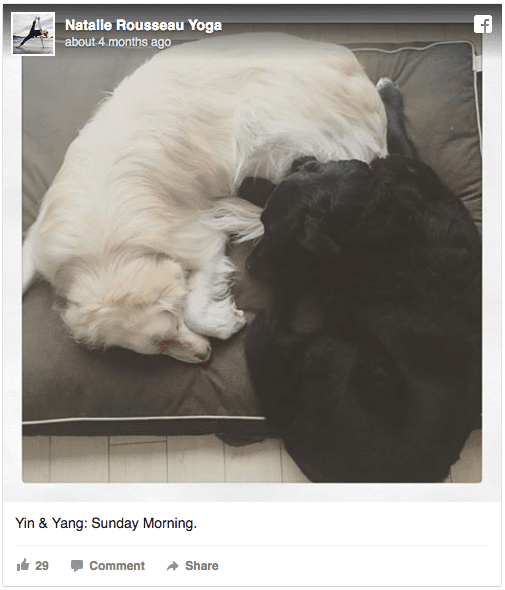 Sometimes, a picture of a couple of fluffy dogs curled up on the couch is all you need! I would like to see a more variety on Natalie’s yoga page. I’m happy to see her working it and promoting her offerings, but a few more purely fun, informational, or instructional posts would add some depth and interest to her feed. What’s Great on Nico’s Facebook Yoga Page? A lot of the appeal of Nico’s Facebook page lies in the stunning photography. He obviously has a very patient and skilled friend with a camera — or he has a photo budget. If you have a snap-happy friend, Nico’s page is a great example how to make use of your great photos. I love the simplicity of Nico’s Facebook feed, too. He shares promotional posts and balances those by consistently sharing impressive yoga pictures with thoughtful captions. And judging from the number of likes he gets on those posts, I’m not the only one who thinks they’re great. His series of 16-second yoga videos are also very slick and inspiring. This one simple post has more than 60 likes and 20 comments. That is engagement GOLD. How did he do it? Just ask a simple question that everyone can answer and voila! After spending some time on his page, I don’t feel like I know much about who Nico is as a person. What’s his life like, what are his classes like, is he bubbly, serious, shy, tough? Also, I’d suggest that he schedules posts for consistency. Some days he doesn’t have any posts while others have three or four. 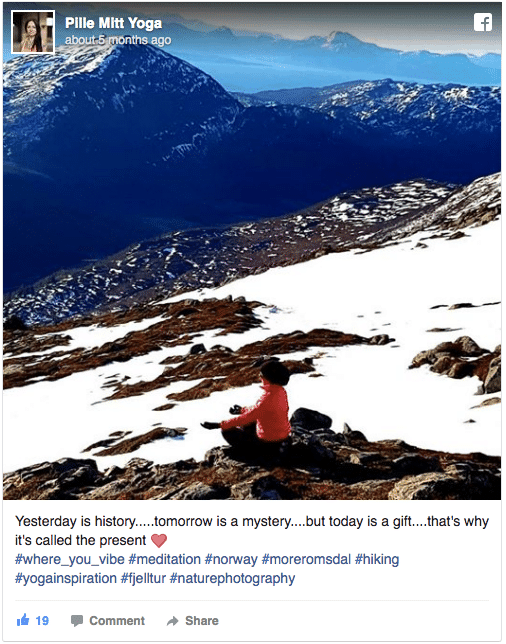 What’s Great on Briohny’s Facebook Yoga Page? Using her cover photo to promote her next teacher training is wise use of the most prominent part of her page. A+ for the graphic design, too. The amount of text on the photo is perfect and the photo itself is eye-catching. 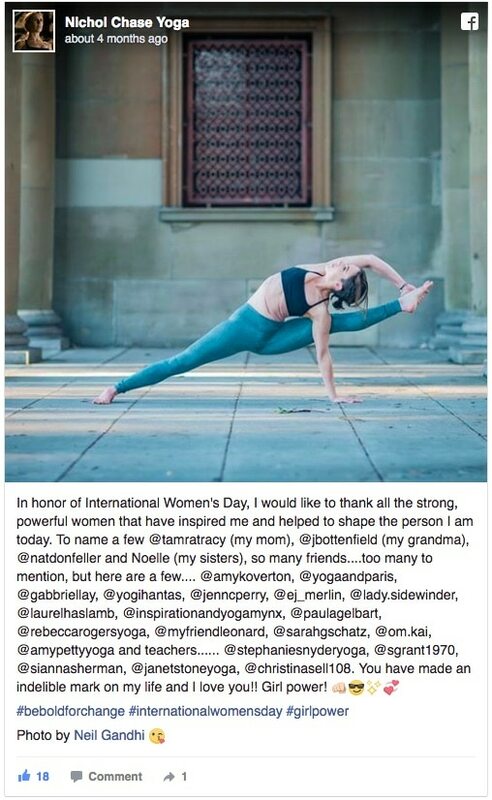 Another thing Briohny does really well is to reach out to other yogis and brands on her page by talking about them and tagging them in her posts. Almost every post on her page tags someone or promotes something. Yet, she manages to do this in a sweet and authentic way. These posts probably make the tagged person feel great and garner lots of likes! Here’s an example of what I was talking about above. This is very smart marketing! Briohny’s About section needs serious help! The only info there is a link to her website. I’d love for her to fill out her bio and story so new students can find out more without leaving Facebook. 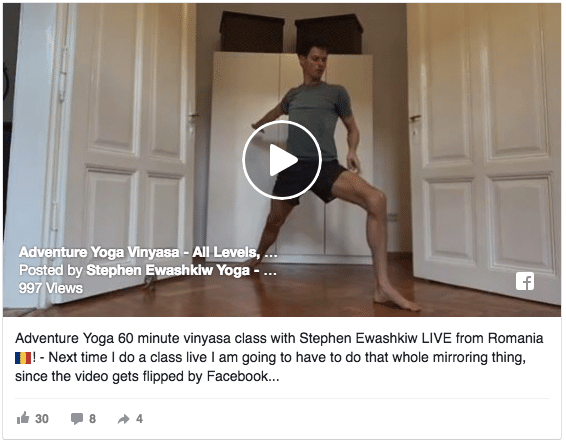 What’s Great on Stephen’s Facebook Yoga Page? OK, admittedly I might be a little biased here… In the past year, Stephen’s Facebook page likes have more than doubled, so I feel pretty comfortable saying that Stephen is rocking it on Facebook. I like how Stephen’s cover photo tells a story. 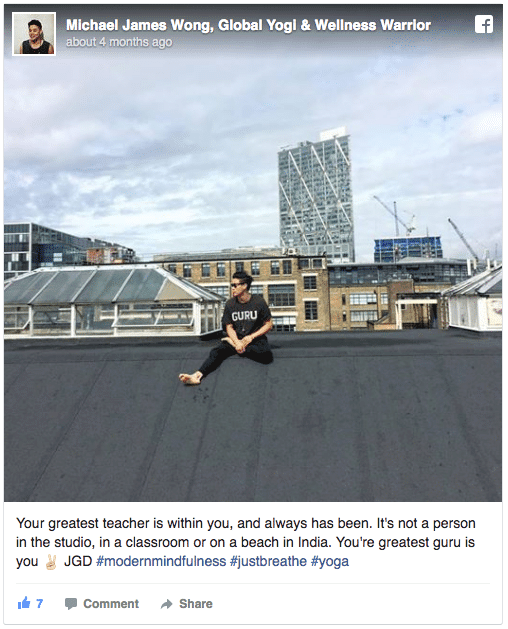 Not only do they show him in exotic locations, either teaching or practicing an “adventurous” yoga pose but the addition of a short testimonial adds social proof to the page. As soon as a new student lands here, they will know that Stephen has dedicated students who are huge fans. If you want your own testimonials, just reach out to a few of your favourite students and ask! They’ll be more than happy to help you out. But the most powerful part of Stephen’s page is the videos tab, which includes live classes, short yoga tips, and yoga marketing tutorials all neatly organized into playlists. Stephen has been experimenting with live video recently and it has been a huge success so far. Facebook Live is an easy way to get yourself out there without having to be perfect! Come up with something you want to share and give it a try. We love Facebook Live for Stephen’s page because it’s quick and easy – just set up the camera and shoot, no post-production needed! Live videos also reach more people than any other kind of post. Plus, live classes are a great way for Stephen to stay connected to his students around the world. I’d like to see Stephen using his Facebook Page as more of a community. Right now, it is mostly one-way. Stephen posts, people hit “like”, but there’s not a ton of conversation going on. He could benefit from starting discussions, asking questions, and inviting fellow teachers to join the conversation. If you’re even a little unsure of what you’re doing with your Facebook Yoga Page – or you don’t have a Yoga Page yet — start with this free video tutorial Jane made. She walks you through all the steps to figure out your personal brand and get your Facebook Yoga Page set up the right way. It will give you a super-solid foundation for your online marketing journey. What Facebook yoga page would you recommend? What do you like to see from your favourite yoga teachers on Facebook? Are you rocking it on Facebook? Share in the comments below! Nice post, Thanks for sharing wonderful information. Hey, nice article. Thanks a lot for sharing. Thanks for sharing this review of facebook pages. It’s great to read your thoughts on what’s working and what can be changed. Keep up the good work, I’m reading it! Thank you so much for this post, I was looking for inspiration to update my Yoga Facebook page & you have given me loads to think about. Great Catherine! So glad it was useful to you. I just had a look at your page and really love your niche. Yoga mums go take a look!